Immersive Surfaces opens September 23rd and will be on view until Sunday, September 25th, 2011. The exhibit was organized on the occasion of the Dumbo Arts Festival and will be on view in the Archway and Anchorage of the Manhattan Bridge. I recently sat down with a few of the guys who are behind the scenes of both Immersive Surfaces and As Above – So Below the third installment of video projection and mapping. Q: You work with SenovvA Inc. one of, if not the largest lighting/projection companies in the country. What motivated you and the company to participate in this particular project which merges and introduces, art, creative content and various technique in the public realm? TV: We, as SenovvA also inhabit an interesting space in our respective industry. We often feel like we’re standing in the middle of a conversation between the various people involved in any of our projects. In most instances those various people are very much a part of the technical conversation. With that experience, and noting the lack of the connection between the traditional art world/ artists and the technical production world, we saw Immersive Surfaces as an opportunity to facilite the opening of a space for that conversation to take place. Q: As an engineer and artist you have been involved in many different projects both personal and tailored for others. What has been the most challenging and rewarding aspect that emerged out of your participation with Immersive Surfaces and specifically As Above – So Below? 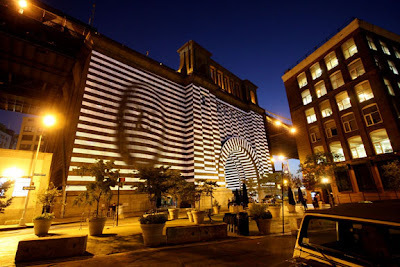 JP: As Above – So Below is unique from other video mapping projects in that it was created by a diverse group of artists with varying backgrounds. The typical mapping project is usually created by technical artists, where our team consisted of a range: from skilled technical artists to the highly conceptual. The collaborative result was intended to be more than geometric light play, we were trying for something that stimulates thought and emotion. Also, since we created the work in a 3D environment, to be projected on/in a 3D volume with a walk-able archway through the middle, we are able to present the viewer multiple perspectives. One can see content from the exterior of the anchorage, then journey inside the passageway and look up to see the same content from a different perspective. I have no doubt this concept will be explored further by other artists working throughout the video-mapping world. Q: As a curator who has focused mostly on contemporary video art, I’ve noticed that the scale of your projects is growing and involving not only artists, but engineers, designers and companies such as SenovvA. 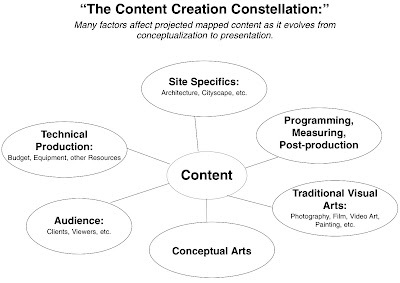 In your editing and selection process of choosing who is involved in a particular project, how important is the concept of “Content Constellation” which I’ve heard you mention, when weaving a web of various visual aesthetics? LK: “The Content Constellation” is a term I came up with to describe how various positions important to mapped projections necessarily affect the content. Site specifics, such as cityscape and architecture, seek a balance with mapping technology/programming, and technical production while creative positions as diverse as conceptual arts/photography/video art/painting, etc. also flavor the mix. It is in understanding that all these elements change the content as it moves from conceptualization to presentation, that we can begin to get a better picture of this new type of, practically, ‘group-art’ collaboration. And, of course, you can’t forget about funding. All images courtesy of Leo Kuelbs, 2011.